Cambodian Prime Minister Hun Sen led a high-level delegation to pay an Official Visit to the People’s Republic of China from 20-23 January 2019, at the invitation of H.E. Li Keqiang, Premier of the State Council of the People’s Republic of China. This time marks the 6th official visit during the premier’s 34-year leadership. “During the visit, Prime Minister Hun Sen will call on H.E. Mr. Xi Jinping, President of the People’s Republic of China, H.E. Mr. Li Zhanshu, Chairman of the Standing Committee of the National People’s Congress and H.E. Mr. Wang Yang, Chairman of the Chinese People’s Political Consultative Conference, and hold bilateral meeting with H.E. Mr. Li Keqiang, Premier of the State Council. The talks will focus on further strengthening Comprehensive Strategic Partnership of Cooperation between Cambodia and China for the benefits of the two nations. A number of documents on bilateral cooperation are expected to be signed during the visit,” according to foreign affairs ministry’s press release. The premier will be accompanied by H.E. Mr. Hor Namhong, Deputy Prime Minister, H.E. Mr. Sun Chanthol, Senior Minister, Minister of Public Works and Transport, H.E. Mr. Pan Sorasak, Minister of Commerce, H.E. Mr. Thong Khon, Minister of Tourism, other senior government officials and business leaders from the Cambodia Chamber of Commerce. In addition, Prime Minister will receive separate courtesy calls by Minister Song Tao, head of the International Department of the Central Committee of the Communist Party of China and H.E. Ms. Gu Xiulian, Chairperson of China-Cambodia Friendship Association and four business leaders from China Bank, China Road and Bridge Corporation, Sinosteel Equipment & Engineering Co. Ltd., China Huaneng Group. 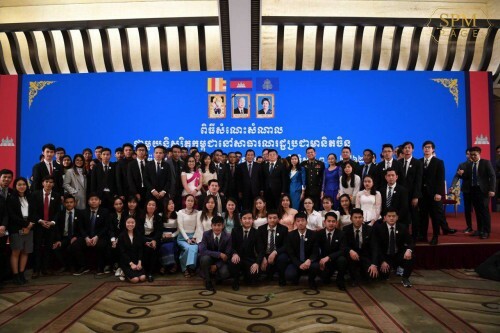 While staying in China, Prime Minister plans to visit the Exhibition of the 40th Anniversary of the Reform and Opening-Up of China and preside over the opening session of the Cambodia-China Economic and Trade Forum 2019 and meet with Cambodian students. Chinese Ambassador to Cambodia Wang Wentian spoke at a press conference on 16 January 2019 that the visit will deepen political trust and practical cooperation between the two countries as well as strengthen legal and cultural cooperation in the name of Comprehensive Strategic Partnership. Ambassador Wang said that Prime Minister’s visit will focus on: (a) deepening political trust between the two countries; (b) enhancing bilateral trade and cooperation through Belt and Road and Rectangular Strategy of Cambodia; (c) expanding cultural exchanges on youth, culture, and tourism; and (d) deepening cooperation in law enforcement to fight cross-border crimes as well as illegal gambling, combating human trafficking, as well cyber crimes to ensure sustainable development.